Which Type of Phone Is Right for Your Business? We get it — you have many options for your business communications. Not only are you deciding between vendors, but phone types range from landlines to cell phones to hybrid solutions like VoIP. We are frequently asked: Do you need VoIP if you already have a cell phone? 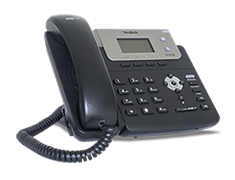 And are there advantages to switching to VoIP if you already have a landline office phone? The answer to both questions is: “It depends.” Review this features checklist to help you make a smart decision about your business’s phone service. Typically, networked phone lines and extension dialing have been limited to landline office phones. A VoIP solution like Ooma Office provides a fully networked phone system for your business at a fraction of the cost of landlines. Incoming callers can select the extension of the person they’re calling, and callers can be transferred between extensions. If you’ve been using cellphones for business, a VoIP network will mean that you’ll never again have to instruct customers to hang up and dial a different phone number so they can talk to your coworker. Cellphones have the advantage of mobility. They’re always in your pocket, and you’re always connected. You might think that because a VoIP phone is able to network your staff together that you would lose the mobility that you have with a cellphone. However, with the Ooma Office mobile app, you’ll have complete remote access to both your work phone and voicemail. So with the app, it’s easy to return that voicemail message after your son’s baseball game ends. Or take care of your messages whenever it’s convenient with voicemail audio sent as email attachments. Have employees who are not in your main office? From telecommuters to delivery truck drivers, it’s common to have employees who aren’t always at your business’s main location. Traditional landline office phones won’t work in these scenarios and mobile phones are limited in how they can interact with your main business line. The hybrid solution of VoIP provides a business phone service that has location flexibility. Using the Ooma Office Mobile app, your employees can make and receive work calls on their mobile device as if they were in the office, a perfect way to stay connected when your staff is on the go. One of the major disadvantages of using landlines and cellphones for work is that your customers end up with multiple phone numbers for you and complicated instructions on when they should use each one. With a VoIP business phone, your communications stay seamless and professional. Whether you’re calling from your cell phone app or your desk phone, your contact number will stay the same. There are legitimate privacy reasons why you won’t want your cell phone number splashed across your marketing materials and website. Having a separate work line means that your personal line will remain private. You won’t have to give out your cell number because phone calls to your work line will go straight through to your mobile device via the Ooma Office app. Plus, you’ve got the freedom to change your mobile number without disrupting your business. And separating your work and personal numbers also means that your customers won’t accidentally encounter that wacky voicemail greeting you set up late one night. There are many reasons for wanting better data on how you use your telephone. Ooma’s call logs make it easy to analyze how you’re spending your time, check up on your staff, or use call durations to bill customers for phone time. First impressions matter. With Ooma, the virtual receptionist is the first thing that a caller hears. It fields incoming callers, provides helpful information, and transfers them to the correct extension. Additionally, there are modes for during business hours and after hours so that callers will be greeted appropriately. Our cell phones don’t do that. Does yours? VoIP gives small businesses access to big business calling features. To get everyone in on the conversation, use Ooma’s conference bridge. You can have up to 10 conference bridges with 10 participants in each. On average, customers who switch to Ooma Office report that they save $1,862 on phone service in the first year. After three years, their total savings is $6,185. That’s a lot of money that will stay in your pocket instead of paying for phone services. Usually when you pay less, you get less. But the innovative phone technology of VoIP provides a more affordable way to get the business communications features you need. 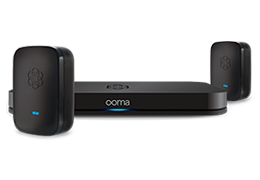 Get started with the Ooma Office Base Station. In your office, you can keep your existing analog phone or upgrade to an IP phone to get higher call quality and additional calling features such as Do Not Disturb and Supervised Call Transfer. Want to know how Ooma’s VoIP phone service can help your business thrive? Watch our Ooma Office features video to learn about the calling tools included with our business phone service.